Formerly catalogued only as 'Portrait of a Man', this portrait can be identified as that of Sir Sydney Waterlow (1878-1944), known affectionately in his family as 'Monarch'. A tall man with a flamboyant moustache, he was a career diplomat and a member of the Bloomsbury Group, who once proposed marriage to Virginia Woolf. He was a member of Gertler's all-male group of friends, known as 'the Thursdays', who met weekly in Hampstead throughout the twenties and thirties. 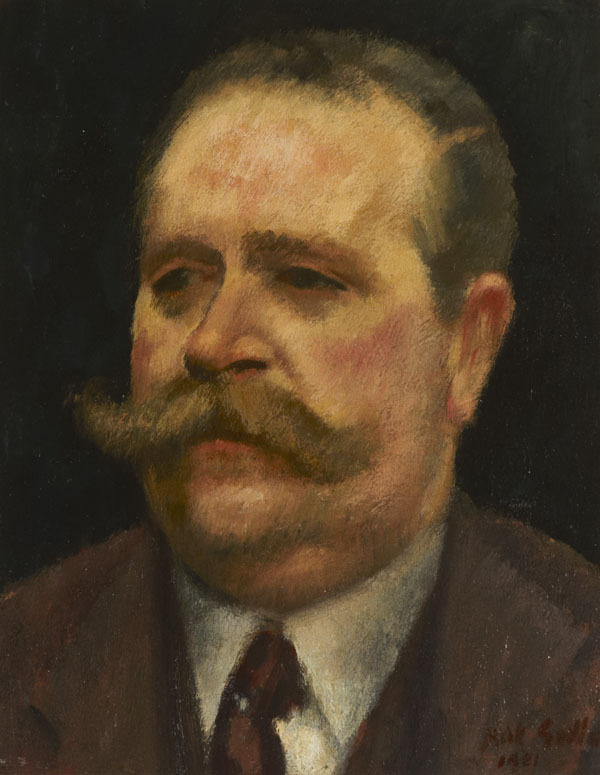 A good likeness, the portrait was exhibited under the title 'Portrait of Mr. S. W.' at Gertler's second solo exhibition at the Goupil Gallery, London, in February 1922. Gertler has often been associated with the Bloomsbury Group with whose members he mixed at the London and Garsington homes of society hostess Lady Ottoline Morrell. These included artists Vanessa Bell, Duncan Grant and Roger Fry (alongside whom he occasionally exhibited, particularly as fellow members of the London Group, although artistically their styles remained distinct), art critic Clive Bell and writers Virginia Woolf and Lytton Strachey (with whom Gertler fell out over his unrequited love for his muse and fellow painter, Dora Carrington, after she set up home with Strachey).